The book shown below is filled with information about Vera Vague's two-reel comedies as well as all the other Columbia shorts. The working title of this movie was LOOSE IN THE CALABOOSE, but as usual the film was released with a different name. When Emil heard what they called it, he didn't know if it was spelled with C's or K's and chose the latter when he entered it in his journal. Correctly spelled CLUNKED IN THE CLINK, this was Emil's third appearance with Vera Vague, a former radio star whose real name was Barbara Jo Allen. Her character "Vera Vague" became so popular, though, that the actress adopted the name as her own. 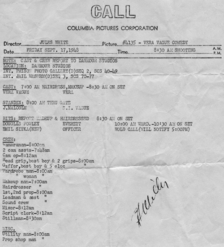 Vague made sixteen two-reelers for Columbia between 1943 and 1951, and Emil appears in four of them. 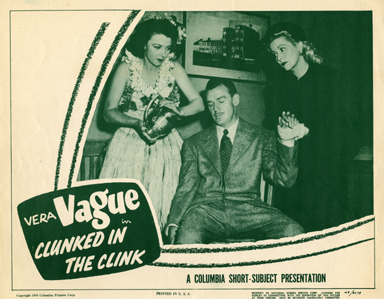 Emil's very first movie acting job as in Vague's HISS AND YELL (1946), which was nominated for an Academy Award in 1946 for "Best Short Subject." The other two films that teamed Emil with Vera Vague were RENO-VATED (1946) and NURSIE BEHAVE (1950). 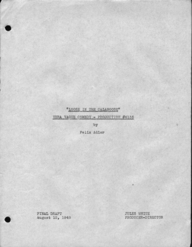 Written by Felix Adler and directed by Jules White, CLUNKED IN THE CLINK features Stooge regulars Christine McIntyre and Vernon Dent, joined by veteran character actor Douglas Fowley. Vera plays a housewife who is mistakenly thought to have been on an airplane that crashed over the ocean. Her husband thinks she perished in the crash, but she's actually been arrested for speeding on the way to the airport and is spending thirty days in jail. In a small role, Emil plays the "hard-boiled jail officer" who books Vera in to the "Calaboose" and tries to take a mug shot. Vera's wacky posturings in front of the camera frustrate his attempts to take a good picture. This leads him to demonstrate how to properly pose for a booking photo, but Vera snaps the shutter and ends up taking a photo of him. Quoting the script, Emil then "goes berserk," and in Stooge-comedy fashion, he "begins tearing chunks of hair out of his head and throwing them to the floor." As I rehearsed my scenes with Vera Vague in this comedy-short at Columbia's Darmour studio this morning I was complimented by Douglas Fowley and others for my "good acting." 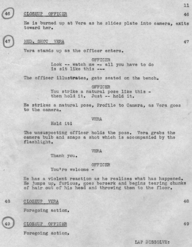 My role was that of a flustered policeman opposite zany Vera, in a police-station. Tonight I attended another rehearsal of "Vipers Fang"
The actor mentioned in Emil's diary, Douglas Fowley, played Vera's husband, "Doctor Everett Vague." Fowley was a busy character actor throughout the 1930's and 40's, remained active in the following decades, and eventually appeared in hundreds of films, many featuring big stars such as Clark Gable, Spencer Tracy, Ava Gardner, Frank Sinatra, and Gene Kelly. Fowley's most remembered role is that of the "film director" in the musical SINGIN' IN THE RAIN (1952). Some fans may recognize him as "Doc Holliday" in the western television series THE LIFE AND LEGEND OF WYATT EARP, seen in the late 1950's and early 60's. Emil and Fowley's paths crossed again ten months later during the making of BEWARE OF BLONDIE (1950). An obscure entry in the list of Columbia's shorts, no copies of this CLUNKED IN THE CLINK (1949) have surfaced, and so it remains on the list of my father's films I haven't yet seen. And in over fifteen years of searching, only one collectible item from the title has turned up. That's the extremely rare lobby card pictured at the top and in the gallery below, which when I found it was cause for a minor celebration. (Perhaps only a collector would understand!) Fortunately it's a beauty, displaying a great image of the film's stars, Vera Vague, Douglas Fowley, and Christine McIntyre.